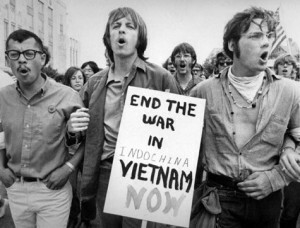 The Vietnam War was one of the most disruptive and divisive conflicts of the 20th century. The struggle for Vietnam dates back centuries, to when Vietnam was ruled by its powerful northern neighbour China. Viet rulers regained control in the 10th century and maintained their autonomy for almost 800 years. By the 19th century, however, the tide of European colonialism was lapping at the shores of Vietnam. In the mid to late 1880s French imperialists muscled their way into the region, disempowered the Nguyen emperors and began to assert control. Vietnam was transformed from a thriving kingdom based on community and subsistence, into a colonial slave state focused on labour, production and exports. Vietnam remained this way until World War II, when the country was overrun by Japanese forces and French imperialism was replaced by its Japanese counterpart. When the Japanese surrendered and withdrew from Vietnam in 1945, Vietnamese nationalists led by Ho Chi Minh declared their independence. France, however, moved to regain control of Indochina – helped by the backing of its Cold War allies. The Viet Minh, a nationalist-socialist militia led by Ho Chi Minh, initiated a struggle for Vietnamese independence that would last three decades. After the Viet Minh defeated the French in 1954, Vietnam’s future was mapped out in the Geneva Accords. The country was partitioned into two states: communist-ruled North Vietnam and United States-backed South Vietnam. Elections to resolve Vietnamese self determination and reunification were scheduled for 1956 but never eventuated. In the late 1950s communist insurgents began attacking government targets in South Vietnam. Despite waves of US-supplied aid, weapons and military advisors, the situation in South Vietnam continued to deteriorate. In August 1964 a confrontation between US and North Vietnamese vessels in the Gulf of Tonkin prompted a more determined American response. The outcome was the Second Indochina War or Vietnam War, a conflict that lasted ten years and claimed more than two million lives, among them 58,000 US soldiers. Alpha History’s Vietnam War website is a comprehensive textbook-quality resource for studying events in Vietnam, from the 1800s to 1976. It contains more than 400 different primary and secondary sources, including detailed topic summaries and documents. Our website also contains reference material and resources like maps, timelines, glossaries, a ‘who’s who’ and examples of Vietnam War music and movies. Students can also test their knowledge and recall with a range of online activities, including quizzes, crosswords and wordsearches. Primary sources aside, all content at Alpha History is written by qualified and experienced teachers, authors and historians.